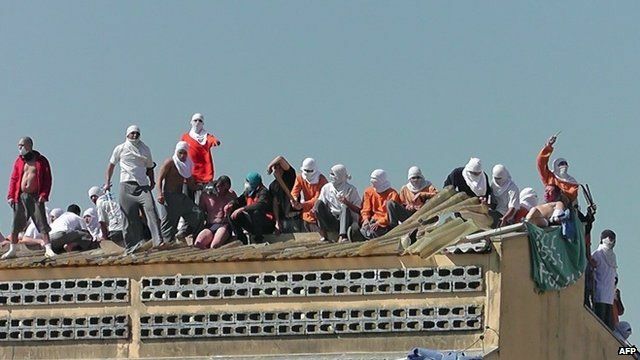 Five killed in Brazil prison riot Jump to media player Police in Brazil say rioters in a jail in the southern city of Cascavel have killed five fellow inmates and injured several others. Cat 'arrested' at Brazil prison Jump to media player A cat has been found in the grounds of a jail in Brazil with contraband goods for prisoners strapped to its body with tape. Brazil prisoners pedal for freedom Jump to media player Inmates in a prison in Brazil are being offered the chance of reduced sentences - in return for generating electricity by pedalling on exercise bicycles. Police in Brazil say rioters in a jail in the southern city of Cascavel have killed five fellow inmates and injured several others. The BBC's Wyre Davies says the prisons are effectively run by gangs and are "beyond the reach of the law".